Here you will find some great kitchen designs & Kitchen Ideas. 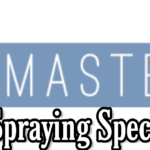 Professional Kitchen Cabinet spraying is a great way to transform your kitchen. The dated traditional kitchen look, solid wood & brown. This kitchen has been transformed to colour RAL 7040 “Window Grey” & it looks amazing. 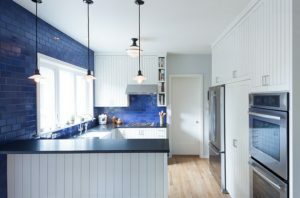 The dark blue lower half & white or pavilion grey upper half of the kitchen cabinets. Now to pull this look off you need good natural light coming in & white walls & ceilings in order for it to really work. 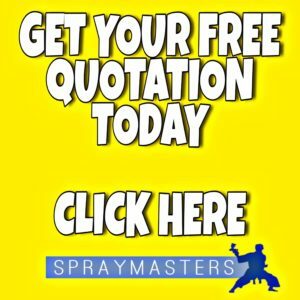 SprayMasters UK can even help out with your worktops as we have some great contacts that won’t charge you the earth. 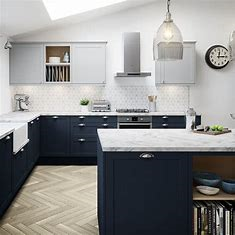 Here on this image they have opted for the ceramic tiles to be sprayed blue on the window wall side & the rest of the kitchen white. We spray many ceramic tiles along with the kitchens, it’s another great idea, it’s quick & it’s cost effective. Remember natural light is key to pulling of the blue tones. In this image it features another colour from the farrow and ball range, this time it’s brassica no 271. The home owner has good natural light coming in which makes the colour really stand out. This colour has nice lavender tones a sophisticated feminine colour choice. The notorious power house “Manor house gray” (not a typo) it’s how farrow and ball spell it. This colour is a true heavy weight, it adds style & sophistication. Manor house gray retains it’s colour in all lights, it’s a grey that sits proud in any home. 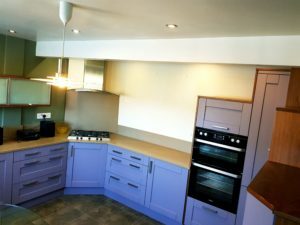 SprayMasters UK have done many kitchens in this particular colour, that’s how popular it is. It Sits really well with pavilion grey & white worktops. You wouldn’t add bright colours to go with Manor house gray. This grey is somewhat of a “new kid” on the block with the SprayMasters, it’s Portland grey. It’s a kind of grey beige, not quite grey yet not beige. This is another great transformation. 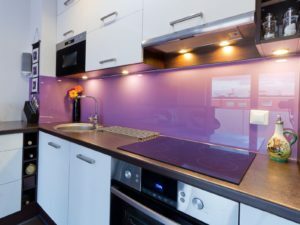 Ceramic tiles can be sprayed as part of the kitchen transformation package but glass splash backs can also be sprayed. 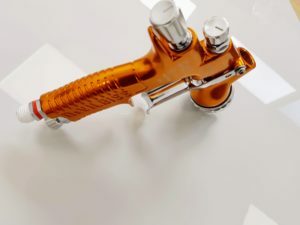 The advanced technology in spray coatings is amazing you can literally have pretty much anything sprayed & it looks fantastic. Spraying ceramic tiles and splash backs are extremely cost effective. Another example of a sprayed glass splash back. 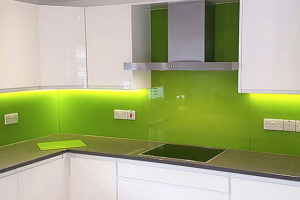 Here we have a green splash back that sits along side a high gloss white sprayed kitchen. We don’t sell many high gloss spraying projects the growing trend is a “Matt Finish” It’s modern & Stylish. We have completed many high gloss bathroom units & also kitchen units but we have witnessed a change in trends in the last 24 months. 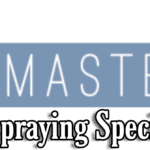 Every customer is going for a “matt” finish as apposed to high gloss, We are huge fans of the matt look at SprayMasters UK. 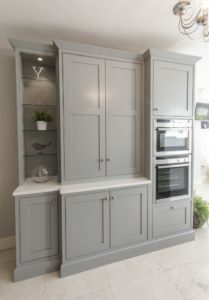 Yes, it’s window grey but on a kitchen it looks amazing, can you imagine your kitchen this kind of grey? The Old brown kitchens are the best transformations. Keep a close eye on our case studies as we do many of these. 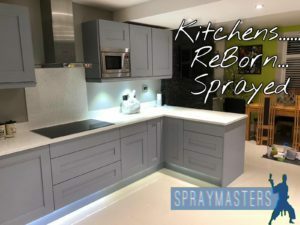 SprayMasters UK Specialise in the revival of old & new kitchens that are wanting a colour change. 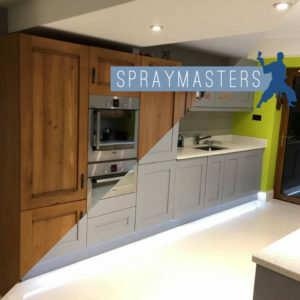 To replace an existing kitchen can cost a fortune & here at SprayMasters we can do more than just spray your kitchen cabinets, we can assist in worktops through our business contacts. We can spray ceramic tiles & glass splash backs, we can help you completely transform your home. 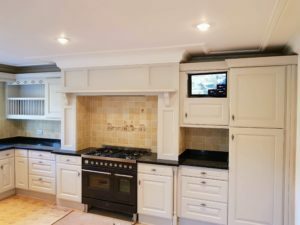 We also offer uPVC Spraying as one of our main services & many of our customers are returning ones as we often either do a kitchen & they have us back for the windows or vice versa.